Contact Tom Martin via email if you have further questions on his offerings. I want to update you on a few items at Aerosente. First I’m approaching the 5th year anniversary of the founding of Aerosente. I’ve had a blast running this business. When I retire from my day job, my intentions are to make Aerosente a full time endeavor. Until then it remains a part-time one-man cottage industry. 1. Proffer Cut. A proffer cut will consist of a small selection of gliders that I will offer on a guaranteed 4 week ship date. I will rotate this selection from time to time and each proffer will consist of 3-5 models in various scales. For example I might offer a 1/3 scale Petrel, a 1/4 scale 1-23 and a Thermic 50. Those of you who want one of those models would place your order and receive a guaranteed ship date. If I don’t ship it on or before the date you get it for free. I’ve been doing this for a while now and it has worked out nicely. I will make the “proffer” via my email list and on my web site. So you will want to either check the web site or get on my email list. 2. Custom Cut. A custom cut is an order that has no guaranteed ship date. Typically these orders will ship in 30-45 days but could stretch as long as 90 days. I will entertain all levels of customization on these kits from plans only, to short kits, to complete full-on, everything included fat kit. You tell me what you want, I quote you, and then invoice you via Paypal. Ordering a custom cut kit is done via email. Send me an email at bolt55@aerosente.com explaining what you’re looking for and then I will respond back with options and pricing. I have shut down our online company store. We had too many options and inventory items for it to work accurately. Which is one of the reasons why I am going to the above ordering process. So from here on out, ordering is done via email or off the www.aerosente.com web site. Back when we started Aerosente I made a deliberate decision to offer a wide range of products. I knew when I made this decision, I would be facing some challenges primarily from the standpoint of inventory investment, inventory control and shipping deadlines. Anybody who has run a production shop knows that there are times when the shop runs smoothly with inventory and production capacity synchronized with incoming orders, and then there are times when it runs rough as a cob. After almost 5 years of running Aerosente I’ve spent more time on the cob side than the smooth side. I know what the solution is - I need to invest in more equipment and build stock so I can ship from inventory. The problem with that solution is the cost. The investment needed to hire helpers, purchase equipment and fund a very slow turning inventory does not make financial sense. I’ve tried noodling around several alternatives - none of which are satisfactory. 1. Batching. I batch my orders for cutting. Which means I collect orders until I get enough to be reasonably efficient in cutting, packaging and shipping. Since I can’t predict when the next order will come in I can’t guarantee a specific ship date. Orders that come in on the front end may wait 30-60 days for shipping. Other orders on the tail end go out the same week they come in. 2. Inventory. My master bill of materials has over 2000 items. I don’t keep all items in stock. I try to keep the movers in but “try” is the operative word. I use a back-of-the-envelope inventory method which isn’t always accurate (Quickbooks at this level of volume doesn’t work). So when I go to pull some 1/8” lite ply and it ain’t there somebody’s kit in mid-cut gets pulled off the laser until I can replenish my inventory. I always “eyeball” my inventory before starting a cut - but I’m not always accurate. 3. Buy-outs. I use several people to make parts. Most of them face the same issues I do and are at times challenged to estimate a ship date. I try to ship complete - shipping partial kits is a whole different issue. 4. Volume. This is the biggest single issue impacting the integrity of ship estimates. The problem is that I’m at the ugly stage of a business where I have too much volume to continue to doing things on the back of an envelope but too little volume to justify the expense of new hires, new equipment and inventory investment. So the reason for the change in shipping is to make sure my customers know exactly what they’re getting and when they will get it. The “Proffer” cut gives me the batching I need to buy inventory and cut efficiently and guarantee delivery. The “Custom” cut gives me the flexibility to collect orders and cut them when it is most efficient and it allows the customer to choose what he wants with a full understanding of the flexible ship date. I hope my customers can put up with these little eccentricities that come from a small “cottage” industry. There are more than 500 of you out there and I have met some great guys over the past five years. I do appreciate your business and your patience. So here is the ultimate Christmas gift for 2013... A Tom Bode designed Big Gull kit. Tom Bode handcrafts some of the best big scale kits worldwide. Tom studied engineering in college but ended up pursuing a career in photography. He is one of those rare individuals equally at home thinking with both his right and left brain, resulting in a kit that is exquisitely engineered, beautifully designed and with the best manuals and build photos available for scale kits today. I am delighted to announce a new kit to the Tom Bode lineup - the Rhonsperber done in 1:2.5 scale. This 40% vintage gull is an exactly scale model of the Rhönsperber, which is stationed in Nastätten / Germany and sells for $1,650. Orders placed today will ship from Germany in 5-6 weeks. What better way to treat yourself at Christmas, or what better use of the year end bonus than buying a Tom Bode kit (of course after you're done paying the mortgage, taxes, college tuition, wife's presents, etc. etc.)? Click here to watch a video of the Rhonsperber's maiden flight. Click here for details on purchasing the kit. I quite often get asked by folks why anybody would spend $1,500 on a kit that you then have to spend another 300 to 400 hours building. I'm always surprised by this question because for many of us, the answer is quite evident... we do this because we love building. 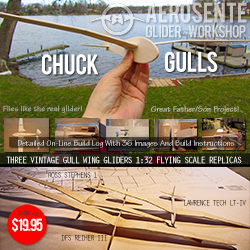 We get a thrill out of taking a large stack of lumber, precision cut parts, and nicely engineered components, and assembling these parts into a magnificent vintage flying machine. We love the build. And few things compare with seeing these spectacular machines take flight for the first time. Now if the Rhonsperber isn't exactly your cup of tea then let me suggest Tom's DFS Reiher III, my most popular Tom Bode kit. This is a classic beauty and I go back and forth between the Reiher and the Petrel as to my favorite vintage gull. Below is the DFS Reiher III in all her naked glory! And, last but not least, the Tom Bode kit next on my build list is the 1:3 scale Condor IV. I have not sold many of the Condors which is a surprise to me. I figured these would be a nice seller here in the States due to it's classic lines, canopy structure and the fact that you don't see many flying here. Be one of the first to get a Condor flying here in the States! Click here for a video of the Condor IV. Click here for detailed information on purchasing the Condor IV. As I finish writing this, the snow is flying and the temperature is 5 degrees. The lake is frozen over and the last of the geese are getting ready to head south. I hope everybody out there has a great holiday season and a prosperous new year! 1. Group Motivation. This is a "paced" build project with a construction schedule designed to have the Petrel's done in time for the May 2014 JR Aerotow. Nothing like a group effort, with scheduled activities and an end goal to get motivated. 2. Designer Support. Tony Elliott, the designer of our 1:3 scale Petrel will be available for ongoing support and advice as we progress through the build. Additionally, one of the advantages of a group build, is that we can share ideas and help support each other as the build progresses. 3. Comprehensive Build Log. 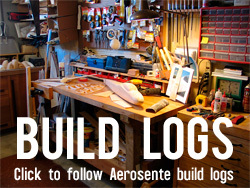 We will be running two build threads - one at RCAerotowing.com and at Aerosente.com. Depending upon the groups participation, we hope to have a comprehensive build resource with narrative, photos and videos. 4. Better Pricing and Sourcing. I will be offering both a short kit and a complete kit for the group build. I have to put in place both a minimum and a maximum number of kits in order for this to work for Aerosente. The short kit for the group build is $795. The complete kit which includes essentially everything except electronics and fabric (sheeting, spars, stringers, laser cut parts, fabricated parts, and hardware) is $1,495. 5. Research and Development. I will building a kit myself with the idea of testing out some new ideas. Inspired by Tony Elliott's 1:2 Wein, one of the ideas we're toying with is a "vintaged" UPandGO sustainer for the Petrel. It would be top-mounted in the fuselage and we would design appropriately "vintaged" hatches etc. For more details on the group build project visit this page http://www.aerosente.com/13-scale-slingsby-type-13-petrel.html for pictures of the kit contents including a detailed list of what comes in each kit. With this being a group build, I will need at least three short kits and three complete kits sold in order for the group dynamics to work. I also have a maximum number of kits I can produce in this time frame so it will be first come first serve for the production slots. Here are the details on the group build. Bob Morrow did most of the heavy lifting on the schedule. This is adaptable based upon input from the group. Project Goal: The goal of the project is to have a monthly build goal leading to completion by the beginning of the end of 2014. Projected Timeline: Because of the scope of this project as well as the size of the Petrel that is being built it is expected to take a full 12 months for completion. This time frame includes not only the building of the airframe, but also the installation of all electronics, complete finishing and detail work. December 2013 PROJECT ORIENTATION Begin project. •	Laser cut parts, wood parts, flat sheet as well as strip woods. All composites for structures (carbon fiber, fiberglass, kevlar). •	Control surface linkages, linkage rods, tow release mechanisms, assorted hardware as needed. •	Adhesives including alpha cyanoacrylates, epoxy resins, aliphatic resins, and various fillers. These should be purchased fresh to insure proper bonding of all materials during the project. •	Various finishing materials such as covering and paints may be purchased at this time, or purchased at a later date during the project build. Do note that various flying surfaces will need to be covered during the build for completion of the airframe prior to final finish work. Covering materials are at the discretion of the individual builder, but do remember that the Petrel is a vintage sailplane that was typically finished in wood and fabric covering. •	Various materials for building boards and building jugs as needed, especially for the gull wings. These can be plywood or particle board. The jigs will need to be constructed prior to the build of specific components of the airframe. •	All electronics including receiver, servos, wiring materials, batteries (two packs as primary and secondary for the receiver and servos, which must be the same chemistry and matched). •	A receiver/power board such as a SmartFly or Royal is highly recommended due to the size and complexity of the electronics installation. 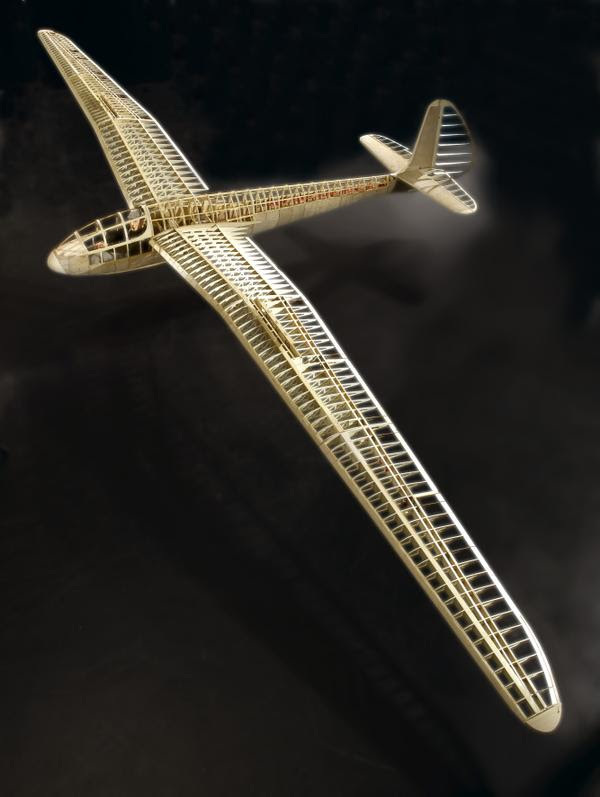 Many of these various parts and components are at the discretion of the individual builder, but there would be specific recommendations made for specific materials based on the specifications of the plans and build instructions included with the kit. Also note that the specifications of the radio and electronics equipment must be carefully considered due to the size of the airframe in which these components will be installed. It is critical to use reliable electronics such as a 2.4GHz receiver, a power board or similar due to the number of servos, and servos that are sufficient in torque for the various control surfaces and mechanisms of the Petrel. I would personally recommend all HV digital metal geared servos, using a minimum of 100 in/oz to 200 in/oz torque or more for the ailerons, elevators, and rudder. The spoilers do not need as high a torque, but they should also be HV digital metal geared and be able to operate the spoilers without fail. The tow release should be a HV digital metal geared servo with a minimum of 200 in/oz to 400 in/oz of torque or more. Any of the popular brands of electronics currently in use should be excellent for this airframe. These may include Airtronics, Futaba, Graupner, HiTec, Jeti, and JR just to name a few. It would be suggested that the choice of transmitter be one that has at least 9 or more channels for functions and would be a computer controlled radio to help with mixing of various flying modes and functions. While this is suggested it should be noted that there are transmitters less capable than these specifications that would still be able to fly this airframe adequately. Most important is the ability to control all functions of the airframe with ease and also your familiarity and comfort with your transmitter for the safe flying of a 6m size airframe. A personal note regarding electronics: While my suggested specifications I have given previously may seem beyond the needs for this project it has been my experience that using only the best electronics that are beyond the required specifications will help prevent many issues or failures for various airframes that I have flown over 35 + years now. It is not the normal flights or the routine flying that we should be concerned about, but rather the unexpected events and potential over stressing of the airframe that we hope we may have compensated for by choosing components and building methods carefully for a project of this nature and size. Begin initial construction based on the plans and suggested construction sequence of the included instructions. This would be starting the build with the fuselage halves, general sheeting, bellcrank installation, and final joining of the halves to the finished full fuselage. Note: there will be needed installations of various electronic components during the building and assembly process to allow adequate access and adjustment. Be sure to create adequate access to these electronics should it be necessary to adjust or replace components throughout the life of the airframe. Assembly of the stabilizer and rudder as per instructions. Complete fitting of these parts on the completed fuselage, adding fairings and sheeting for final assembly as needed. Note: as with the initial fuselage assembly there will be a need to add various components during the assembly process prior to final assembly to insure all control surfaces function properly. Use the plans and instructions as a guide for this and do read through the steps prior to any final assembly and glue-up. Initial wing assembly beginning with creating of the wing building jigs as outlined in the instructions and plans. These can be built with a variety of materials, but it is important to make sure they are ones that will not warp or flex during the building process. It is critical to build a straight and true wing and that both wing halves are symmetrical with each other once completed After completion of the building jigs the spars will then be constructed as per instructions and plans. These must be constructed carefully as per instructions and plans as they are critical to the structure and strength of the completed wing panels. Build both right and left wing panels using the jigs and spars previously completed. The panels should be assembled as per all instructions and plans and should be completed for spoiler assembly. Note this process is all dry assembly at this point. Glue-up will take place after other structures and component of the wing assembly are in place and all is aligned for final assembly. Spoiler assembly and installation follows, completing all steps of the instructions and plans. Note the installation of various electronics component and servos for these steps prior to final assembly. 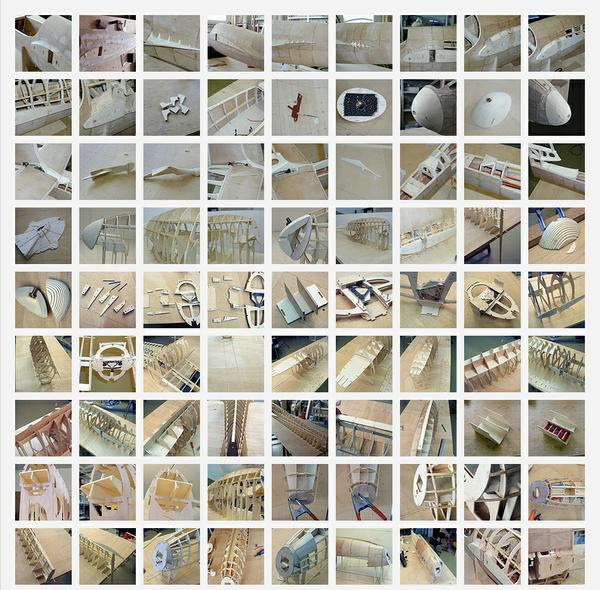 After all components of the wing assembly have been dry fit and completed final assembly and glue-up is completed. Sheeting of the wing should be completed at this stage following instructions and plans. December 2013: WINGS Pages 15-16 of instructions At this point the build of the ailerons and bottom of the wings will be completed as per instructions and plans. Final alignment and assembly of fuselage, wings and tail assemblies. Complete all steps for this process and prepare the airframe for installations of electronics as well as all finishing. February 2014: FINISHING Page 17 of instructions Begin finishing and installations. At this point final choices about finish, color schemes, graphics and scale details should be made. Complete the appropriate installations of all electronics and preliminary adjustments of flying surfaces prior to final finishing. The fuselage should be properly fiberglassed as per instructions to help with the structural integrity. Care should be taken with this process with thought as to the final finish and color(s) that will be used for the completed Petrel. Fiberglassing can be completed and a natural wood finish can be obtained as long as appropriate weight cloth and resins are used. Of course a painted finish is easily applied to a properly glassed surface as well. Scale detailing of the cockpit and other components should be completed at this stage, other than details that would need to be completed after painting. Complete finishing of the airframe, covering of all open surfaces that have not previously been covered during construction and complete painting and application of graphics. Note: seal all edges of covering material to prevent it from peeling or opening. This can be accomplished in a variety of ways and methods, but is important to the longevity of the airframe. Complete all detailing and installation of any equipment or parts that have been on hold. Installation of the pilot and final balancing should be completed as a final step, Use the plans and instructions with care for this, adjusting the balance to be nose heavy for initial flights. A note on balancing: I prefer to always use lead shot (#8 or #9) in conjunction with diluted resin for the final balancing. I typically use this in the nose of the sailplane and make sure to keep it light by about 4-6 ounces of the recommended balance point. To achieve the final balance I like to use strips of lead that can be attached via screw in placement panels in the nose sections. This allows me to add or remove strips as desired to reach the final balance point that the sailplanes flies well at. I always start with the sailplane somewhat nose heavy for docile flying characteristics and then adjust as I complete test flights and changes in the radio programming. Complete any electronics assemblies and installations as well as initial programming of the radio system. Check all surfaces for correct movement and begin making adjustments for various flight modes. After initial set-up and programming is complete the initial test flights should be made to dial in programming. Set control throws for standard thro initially, adding throw after the first test flights. It may be of help to use exponential in the setup of the throws for all flight surfaces. Remember to use differential in the ailerons to have effective turning ability and this can often be mixed with the rudder for thermal and landing modes. I typically have three flight modes for my large sailplanes, the flight mode switch is a three position switch on the top left front of my transmitter: Launch mode: switch is in the forward position in which I have flaps active with the ailerons for full surface deflection to increase the lift of the wing (the Petrel does not have flaps, and as such there will not be mixing of these functions for this airframe). In this mode the ailerons are independent of the rudder and I do not have them mixed, as the critical issue with launch is to get off the ground and keep the wings level during tow. I also have the tow release active in this mode to enable release at any point during launch and tow. I typically have my tow release switch on the upper back right of my transmitter, as an on/off toggle. I have always kept this position for the release to have consistency between sailplanes. Thermal mode: switch is in the middle position in which I now have the ailerons and the rudder electronically mixed to help with thermal turns. All functions are active in this mode as well as spoilers. Landing mode: switch is in the backward position and in this mode I have my spoilers and elevator mixed to adjust for landing approaches. This is designed to help compensate for the effects of the spoilers on the pitch of the sailplane as they are deployed, to keep a slightly nose down attitude. Final adjustments and mixing is definitely a personal preference to the individual and also an art form specific to the airframe. The Petrel was designed to fly in a comfortable envelope of speed, but not necessarily at high speeds. It should thermal gracefully and be able to detect light lift with the movement of the wingtips or pitch change as tell tales. TEST FLIGHTS Continue test flights and adjustments of programming for the airframe. After several flights the lead ballast should be adjusted and fine-tuned to the specific choices of your flying style. 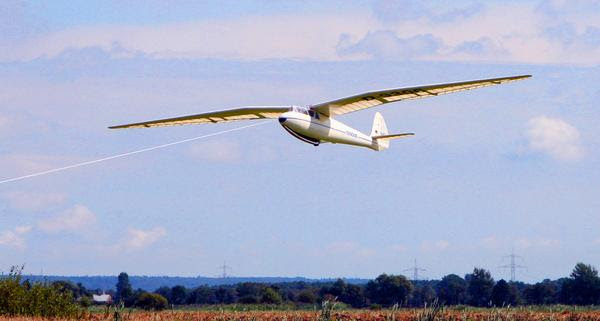 Many choose to have the sailplane slightly nose heavy and be a bit more docile, yet others may prefer to start moving the balance point rearward and find a point where the sailplane “talks” as flying conditions and thermals vary. This is really a matter of personal preferences. Do be aware that movement of the balance point rearward should be completed and tested in very small increments, as there may be a point of instability that is reached quickly leading to the loss of the sailplane as well as safety concerns. Once the sailplane is flying well I always make copies of the programming of my radio as back-up and keep the programming in my computer system. This will allow me to fine tune as desired and also to reprogram the transmitter in the case of the loss of programming by error (which has happened more than once to me !). Additionally replacements supplies should be assembled that include replacement servos, horns, connectors etc. It is always a good idea to have a “Kit” for each specific model that would include replacements for the sailplane. I will typically have several extra servos that are used for the various control surfaces and functions as well as a range of other materials and replacement parts. Having spares while traveling and flying at various events helps with keeping the sailplane in flying condition. The extent of these spares depends on the individual and also the rigor of the flying season. I will typically attend several events from the months of April through October as well as local flying in the nearby sites where I live. While at events I will use spares as needed, but while in my local area I always bring the sailplane home to do complete inspections and replacements in the shop where I can focus on the work carefully and hopefully catch any other issues or problems that I may have missed at the field. A very astute pilot once told me that all launches are optional but landings are required ! June 2014: JR AEROTOW JR Aerotow………finally ! This month my feature interview is with Chris Fenger. Chris has recently restored a Schweizer SGS 1-26 and since this is one of my most popular kits, I thought you guys might be interested in his restoration. Chris did a nice job photographing the restoration and I have included most of his photos because they are an excellent resource for scale detail. Enjoy! If you haven't signed up for the monthly newsletter then go here to submit your email address. Click this link to download. Great interview this month with Don Rice!